I’m at a weird transition point in my life. Just a few weeks ago, I was working full time, volunteering once a week, and taking an online medical biochemistry class to fulfill a prerequisite for graduate school. I felt busy and stressed, but I was in the groove. There came a point when I had to let something go. I stopped volunteering and I quit my job. I went back home to California for a week and was able to completely relax and gather myself. Now that I am back in New York, my main responsibility is to do well in this biochemistry class. Sure, I study throughout the day, but boy do I have gobs of free time. What a blessing, right? I’m trying to seize the day and take advantage of my new-found ‘freedom,’ but it is hard to get out there and explore when I feel obligated to catch up on Parks and Recreation and devour the tin of chocolate covered almonds in my pantry. Life is so hard sometimes. At least now I have the time to experiment in the kitchen and cook healthy meals for myself. The tofu gods were calling on me this week, I’ve been craving tofu like a maniac (see my previous post on Tofu Bento Bowls). 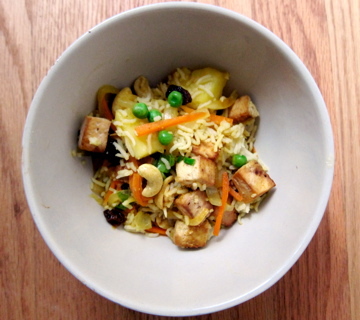 And now that I finally realize how important it is to drain and press the tofu (see recipe below), all of my tofu dishes have been turning out better than ever. 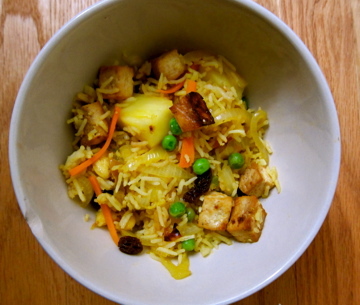 This recipe is from Chloe Coscarelli’s book. This is her Pineapple Not-So-Fried Rice. In her picture, she plates the dish in a pineapple boat. I tried to do the boat, I even looked up how to do it online and watched a video. When push came to shove, things just got messy and I found that I was wasting to much of the sweet flesh. I broke down and cut the pineapple up and ate my meal out of a bowl. Oh the perils of being uncreative/lazy. Despite the pineapple boat failure, the meal tasted superb. There’s sweet yellow pineapple and crunchy raw cashews. Baked tofu and bright green peas. Shredded carrots and studs of raisins. 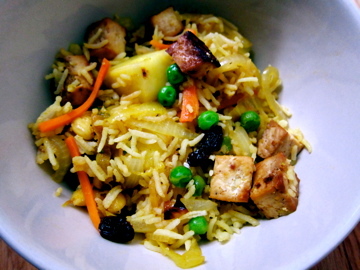 With all sorts of onion and garlic and spice to flavor the rice. Tofu cubes fresh out of the oven. Ain’t nothin’ better. All it took was a good pat-dry and a press, a little soy sauce, and an oven. Note: The first thing I did was get my rice cooking so that it would be fully cooked for when I needed it later. To prepare the tofu: Wrap the tofu tightly in dry paper towels or a clean kitchen towel. Set the tofu on a flat surface and place a small baking pan on top. Then stack something heavy, like canned food or books, on top. Let the tofu sit for 20 minutes while it releases its water. When ready, discard the towels and cube the tofu. Preheat the oven to 325 degrees. Line a baking sheet with parchment paper. 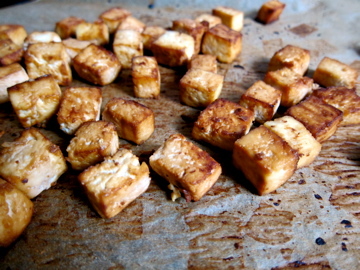 Toss the tofu with the soy sauce, making sure each cube is coated. Place in one layer on the prepared baking sheet. Bake for 45 minutes, turning the tofu a few times with a spatula. Remove from the oven and set aside. If you are using a whole pineapple, peel it and remove the core. Slice the pineapple into cubes. If you want to make a pineapple boat for serving, cut the pineapple in half lengthwise, remove the inner flesh with a paring knife, then cut into bite-sized pieces (I tried to do the boat, but found that I was losing too much of the good flesh, so I nixed the idea). In a large skillet or wok, heat the oil over medium-high heat and saute the onions until soft and lightly browned. Season with salt. Add the garlic, scallions (if using), curry, coriander, and chili-garlic sauce. Let this cook a few more minutes. 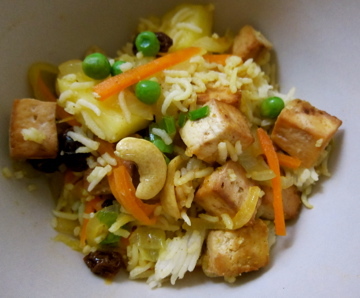 Add the cashews, carrots, peas, raisins, cooked rice, water (or broth), pineapple, and tofu. Cook until heated through and adjust salt to taste. Serve the rice in the pineapple shell (if you are brave enough to try the boat method) or simply in a bowl. Enjoy! Steph!! 2 things- #1, it was SO great seeing you when you were here! just like old times. i’m glad you enjoyed your time in the sunshine state! 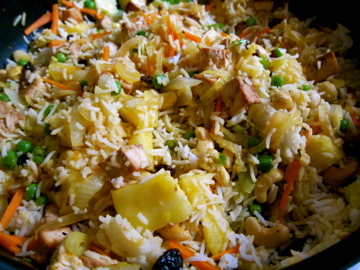 #2- pineapple fried rice is one of my biggest weaknesses/favorite meals in the universe. I will DEFINITELY be trying this recipe soon! My mom also picked up some seitan for me at the market recently, but I don’t know what to do with it! Any ideas? MIss you!! P.S. Have you eaten at Flore in Silverlake? It’s great and you could probably get a lot of seitan ideas from them. The Flore burrito is my favorite thing to order there!